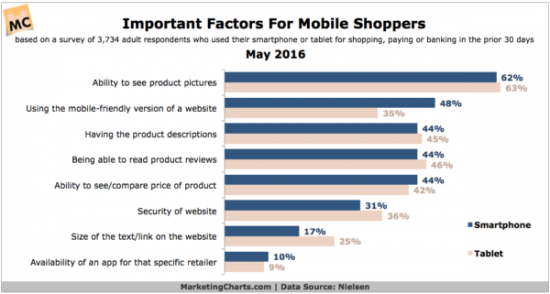 What Do Consumers Want in the Mobile Shopping Experience? Mobile users do everything on their phone including chatting, socializing, researching, and of course shopping. Mobile already accounts for 30% of ecommerce and according to company Coupofy.com, mobile commerce is growing 300% faster than traditional ecommerce. As consumers increasingly transition from their desktops to mobile devices, organizations across all industries need to pay full attention to what mobile consumers value and expect from brands. Brands are aware of the overlap between the offline and online channel experience and this will continue to play a critical role in the mobile experience. 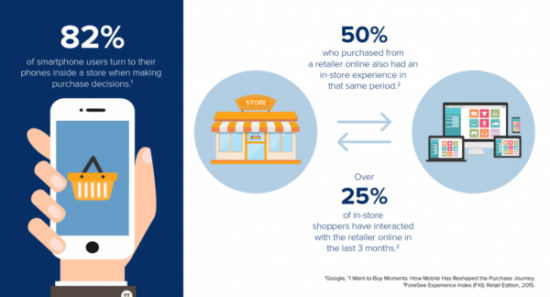 According to insights from Google, 82% of smartphone users turn to their phone while in a store to help make purchase decisions. In response, retailers are implementing innovative technologies to tie the offline and online mobile experience to create a seamless and personalized purchase journey. Furniture retailer IKEA is a great example of a brand who is responding to its mobile base. The company, which prints millions of catalogs, implemented image recognition in its catalogs. Readers can scan the catalog with their mobile devices to see relevant content, 360-vew furniture displays and can even visually place furniture pieces in their homes. Beacon-enabled technologies are also on the rise, allowing brands to target consumers with personalized offers, loyalty rewards and mobile payments. 85 of the top 100 retailers are planning to adopt beacon technology by the end of 2016. Additionally, Business Insider expects beacons to have a direct influence on over $44 billion in US retail sales in 2016. Nielsen recently conducted a survey among 3,700 mobile device owners who had used their smartphone or tablet for mobile shopping, paying or banking in the prior 30 days. The research reviewed the shopping habits of both mobile phone users and smartphone owners. According to Nielsen, the most common activity by both groups of mobile device owners is researching an item before purchasing (72% and 66% respectively). The second most common activity is checking the price of an item (70% and 57%). Using the mobile friendly version of the website (48% smartphone, 35% tablet). Having product descriptions (44% smartphone, 45% tablet). Being able to read product reviews (44% smartphone, 46% tablet). Ability to see/compare price of product (44% smartphone, 42% tablet). Providing a holistic mobile experience is no longer a luxury for brands. Consumers expect this from every brand they choose to do business with and if a brand doesn’t deliver, they will simply find one who can. 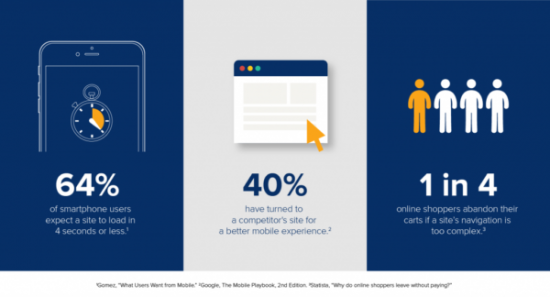 Google research indicates that 64% of smartphone users expect a site to load in 4 seconds or less, 40% of consumers have turned to a competitor for a better mobile experience, and 1 in 4 shoppers abandon their carts if a site’s navigation is too complex. Building a mobile friendly website is of course step one and is expected by consumers. Already, 62% of US online adults expect a mobile-friendly website and 23% expect their mobile experience to change based on location, according to Forrester’s US Mobile Mind Shift Online Survey. 2016 has been deemed the year of the mobile app. The average U.S. consumer last year spent 3 hours and 5 minutes a day using apps, compared with 51 minutes surfing the mobile Web, according to eMarketer. Retailers who have implemented mobile apps have the edge when it comes to how shoppers select and purchase items. While apps tend to be downloaded only by a brand’s most loyal consumers, the payoffs are well worth it. An app produces a treasure trove of data which can be used to personalize offers and improve customer value and retention. As retailers track what a consumer clicks on, browses, or has purchased in the past, this data can be used to create highly impactful offers and predict what a consumer is likely to purchase next.